The 9th Annual Conference of the Consortium of Universities for Global Health (CUGH) will be held March 16-18, 2018, at the New York Hilton Hotel Midtown in New York, New York. The theme of this year’s conference is Health Disparities: A Time for Action, and more than 1,700 scientists, faculty, students, and implementers from more than 50 countries—from academia, NGOs, government, and the private sector—are expected to attend. To learn more about the conference, visit www.cugh.org. Pre-conference satellite sessions will be held on March 15, 2018, organized and coordinated by distinguished academic and research institutions in global health. To learn more about the satellite sessions, visit http://cugh2018.org/satellites. CUGH is a Washington, DC-based organization of over 145 academic institutions and other organizations from around the world engaged in addressing global health challenges. It assists members in sharing their expertise across education, research, and service; is dedicated to creating equity and reducing health disparities everywhere; and promotes mutually beneficial, long-term partnerships between universities in resource-rich and resource-poor countries, developing human capital and strengthening institutions’ capabilities to address these challenges. To learn more, visit www.cugh.org. The 2017 Association for Medical Education in Europe (AMEE) Conference was held August 26-30 in Helsinki, Finland. The AMEE conference is recognized globally as a key annual medical and health care professions education platform, regularly attended by 3,500 participants from all over the world. Session formats included workshops, short communications, posters, specialty courses, symposia, and plenaries. A number of FAIMER staff participated in AMEE 2017, serving as symposium, workshop, and short communication presenters. FAIMER President John Norcini and Research Scientist Marta van Zanten facilitated a pre-conference workshop with WFME President David Gordon, titled The World Federation for Medical Education (WFME) Recognition Program for Accrediting Agencies: Purpose, Processes, and Criteria. Dr. Norcini also gave a presentation titled What are the Implications of Entrustable Professional Activities for Assessment? as part of the symposium Entrustment Decisions: Implications for Curriculum Development and Assessment. Dr. van Zanten and FAIMER Vice President for Research and Data Resources Jack Boulet presented a short communication titled United States-citizen Graduates of International Medical Schools: 1991-2015. Dr. Boulet also served as chairperson of a short communication titled Management and Leadership: Social Accountability, and co-facilitated a workshop titled Scoring Performance-Based Assessments. FAIMER Information Scientist Amy Opalek presented a short communication on behalf of Research Associate Sarah Leng, titled Professional Regulation of Physicians. FAIMER Senior Scholar Robbert Duvivier was the recipient of the 2017 Miriam Friedman Ben-David New Educator’s Award, presented during the opening plenary session. The 13th Annual Association of American Medical Colleges (AAMC) Health Workforce Research Conference was held May 3-5, 2017, in Arlington, Virginia. This annual conference brings researchers, educators, and policymakers together to meet and discuss state and federal health workforce issues. The theme of this year’s conference was Working Together for Health: Aligning the Health Workforce with Population Needs. Several members of the FAIMER Research staff took part in the conference, sharing information based on FAIMER Research and Data Resources projects. Danette McKinley, Director of Research and Data Resources, gave a presentation titled Primary Care Physicians and Vulnerable Populations: A Cross-Sectional Analysis co-authored by Julie Drendall, as part of a plenary session on Provider Types, Populations Served, and Outcomes Achieved. Research Scientist Amy Opalek participated in a breakout session on Aging and a Diverse Population—Implications for Health Workforce with a presentation titled Who Cares for Pennsylvania’s Diverse Patient Populations? Ms. Opalek and Research Associate Sarah Leng also presented a poster titled International Medical Graduates’ Contributions to the United States Health Workforce. The 2017 annual international conference of The Network: Towards Unity for Health (TUFH) took place April 8-12, 2017, in Hammamet, Tunisia. The theme of the conference, which was held in conjunction with the World Summit on Social Accountability, was “Improving the Impact of Educational Institutions on People’s Health.” The program included keynote addresses, didactic sessions, workshops, and poster sessions related to this theme. One highlight of the conference was the session presenting winners of the fifth annual Projects That Work competition, sponsored and organized by FAIMER, which showcased six projects that have been successfully addressing missions related to the conference theme for three years or longer. An annual feature of The Network: TUFH conference, Projects That Work recognizes excellent projects that have succeeded beyond initial implementation and have had a significant impact on health, the community, or the school, in order to encourage the development, implementation, and dissemination of more such projects. An open worldwide call resulted in 27 submissions, from which six were selected by an international panel of 20 reviewers. 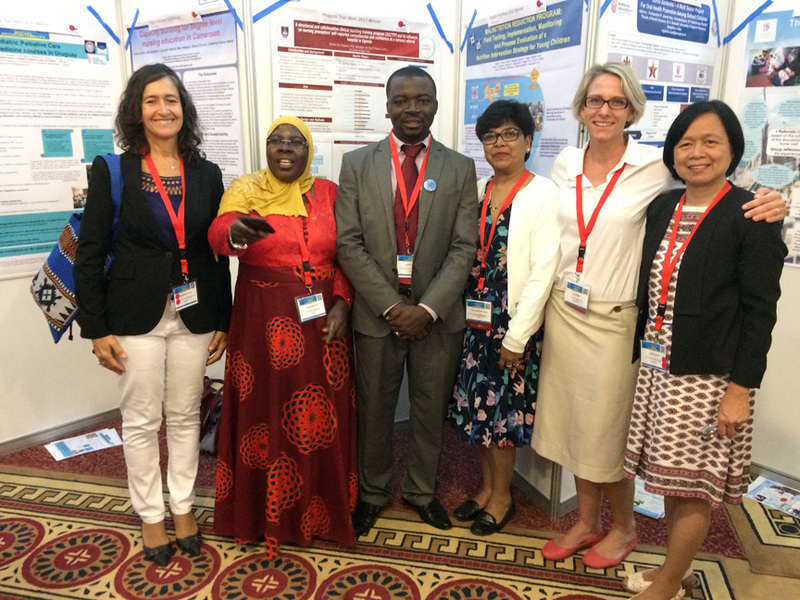 The winning 2017 Projects That Work projects were represented at the conference by (pictured above, left to right) Mercedes Bernadá (Uruguay), Safinah Kisu Museene (Uganda), Esoh Godfrey Nji (Cameroon), Pushpanjali Krishnappa (India), Jana Muller (South Africa), and Julieta Dorado (Philippines). The session was moderated by Ralf Graves, FAIMER Director of Regional Institutes. The projects were presented in a combined panel discussion/poster presentation format to maximize potential for collaboration and sharing between attendees and presenters. The conference also featured the winners of the third annual Student Projects for Health competition. Sponsored by FAIMER and GEMx, the Student Projects for Health competition recognizes the work of students who have made outstanding contributions to projects that successfully promote community health and well-being. The competition was open to all undergraduate and graduate students enrolled in any course of study who have been participating in such projects. An open worldwide call resulted in 130 submissions from which 14 projects were selected by an international panel of 23 reviewers. The students produced posters describing their work, which they presented during two interactive sessions. Projects That Work and Student Projects for Health will also be features of the next Network: TUFH conference to be held in Limerick, Ireland, August 16-20, 2018. Applications are expected to open in early 2018.